Carolina Temple Apartments is a historic Island Inn located in Wrightsville Beach, North Carolina. Built by the Temple Family in the early 1900’s, Carolina Temple Apartments is the oldest business in continuous operation on Wrightsville Beach. Now operated by the Wright’s, it has been in the same family since 1952. Located facing the sound on the south end of the island, it is set back from the road like a well-kept secret, yet only steps from the beach. The Inn was once Station 6 along the Wrightsville Beach trolley line. 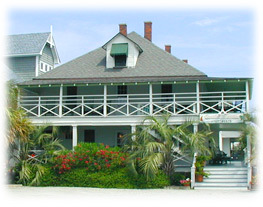 The building is a good example of early coastal North Carolina architecture with central hallways, spacious breezy wraparound porches, furnished with large rockers and the occasional well-placed hammock. Louvered outer doors to each of the 8 apartments, give a Caribbean feel. The apartments are not large but they are beautifully maintained, and are either one or two room air conditioned suites with private baths, ceiling fans and fully equipped kitchenettes. The apartments are perfect for couples or small families. The décor is tropical, with luminous beach colors and Caribbean-style folk art.